In his video, Tony points out that Hong Kong director and action hero Jackie Chan blends comedy and action in a way that Western directors do not. The film lists ways by which Jackie Chan manages to create action with a comic twist. As I listened to Tony's pointers and watched Jackie Chan twirling gracefully through fight scene after fight scene, I found myself having little epiphanies - not about action comedy, but about writing. Jackie Chan always starts by putting himself at a disadvantage. "No matter what film Jackie always starts beneath his opponents. He has no shoes, he's handcuffed, he has a bomb in his mouth." This is the fun of a Jackie Chan movie - the bumbling no-hoper overcoming incredible odds and enemies - gangs of Kung Fu masters, mafia goons, cowboy baddies, what have you. In the end of course the joke is on his opponents who didn't see Jackie Chan coming. It's a reminder to us fiction writers that characters need to change. 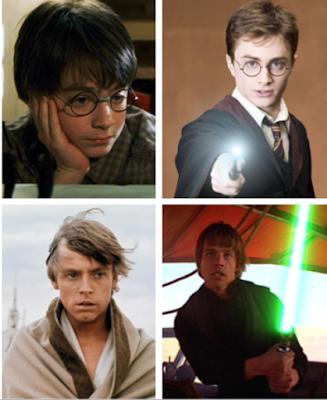 If you're writing a coming of age story, your character at the start will be a child, innocent, naive. Your job is to grow your character into maturity. If you're writing a romance, your character must start out loveless or unloveable before you can begin introducing love opportunities. If it's an adventure you're building, your character must begin the story in a state that is the polar opposite of his ordinary world, in the way that Luke Skywalker lives in a boring moisture farm before he goes off to fight Star Wars and Harry Potter has to sleep in a tiny cupboard under the stairs before going off to live in magical Hogwarts. The unputdownableness of a story is dependent on a reader's desire to keep reading. A reader only keeps reading if they want to find out what will happen to the character. Jackie Chan uses his world to move plot. One of the delights of a Jackie Chan movie is Jackie's creative use of his environment in a fight. He uses everything. He backflips through ladders, duels with chopsticks and Lego, parries with umbrellas, and in one iconic fight sequence, does combat by juggling a massive ladder. These scenes are funny as well as jaw-droppingly skillful. Every story has its own particular world - and the crafty writer will infuse that world into every aspect of his or her storytelling. It's not easy, but it builds the truth of your characters and helps the reader embrace your creation. I recently finished writing a story set in a pre-Christian, tribal setting. I had to think carefully as I told my story from the point of view of my tribal characters - every metaphor had to be based on their realities - birds, trees, weather. It was difficult but very satisfying. When his opponent is in black, he's in white. That's in order for the viewer to see clearly what's going on. Not for him the handheld and dolly shots of Western film making that create a false dynamic, making actors who don't know how to fight look dangerous. In one example, a fighting sequence that ends with a spectacular fall is shot making sure that the staircase is kept in the frame. Thus the viewers become familiar with the landscape and there is no geographical confusion when the fall actually happens. The viewers know the stairs are there, they know how high it is. They know the fall is coming, they are anticipating it. Anticipation is good, it keeps readers reading. The trick is to deliver what is anticipated ... and still manage to surprise. The staircase example also reminded me of one of the best ways to hide exposition. You don't want to interrupt an important moment to explain something. You must make sure you've craftily fed the necessary knowledge to your reader long before it is needed. JK Rowling was fantastic at this. 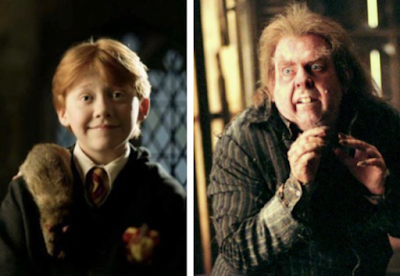 (SPOILER ALERT) Scabbers, Ron's pet rat, appears in the every book until his true identity is revealed in The Prisoner of Azkaban. In that book, Hermione's mysterious ability to be everywhere is revealed to be the work of a time turner - which is the very tool they use to save Buckbeak and Sirius Black. Throughout the book, we know stuff and yet what we know still holds a surprise at the end. Neat! Scabbers lives in the background until his true identity is revealed. Over and over again, the narrator mentions action and reaction. Jackie Chan's visual logic requires that action and reaction appears in the same frame (3:16). You see the punch, you see Jackie recoil. It's part of Jackie Chan's obsession with clarity. It amazed me because action and reaction is something I obsess over when I'm writing new scenes. In fact, I will often scribble 'CAUSE AND EFFECT' on the top of the page when I'm plotting. This is because I've learned that it is action and reaction -- cause and effect -- that creates the feeling of movement in a story. A story is not just pretty writing. As I said before, for a piece of writing to be a story, there should be change at its heart. If there is no change there is no story. And what makes the reader feel that change? Cause and effect. Action and reaction. It's a chain of events, connected because one thing leads to the other. I used to sweat over plotting. I still do ... but thinking about action and reaction has made the task less excruciating. According to Tony's video, Hong Kong directors like Jackie cut fight scenes differently from their Western counterparts. After showing a wide shot of a fight sequence, they will cut to a close up of a pay-off strike (5:26) - it creates a rhythm but also a feeling of satisfaction in the audience to see the coup de grace in close up. The director is saying: check this out, notice this. It's important. Writers are constantly quoting the adage: Show, don't tell. But the truth is you can't show EVERYTHING. There are times when you do have to tell, to keep the story moving. The skill is choosing wisely what you tell and what you show - if it's important, it's got to be on stage. Show it, don't tell it. I've noticed that the medium of storytelling can dictate whether you're showing not telling - eg. in opera, all the big, important scenes are communicated in song because opera is about song. The opera singers tell us what's going on. But opera is in the minority. If you're writing books (or making movies) you gotta put what's important on stage. Jackie Chan does it in his fight scenes. You can do it in your books. The little details that make a fight scene - the flip of a fan, the twirl of a ladder triple his height - are not achieved by pure talent. Jackie Chan is the first to tell you that it takes patience and practice. Jackie will practice relentlessly to get a move right - in the fan scene, he says it took 120 takes before he flipped the fan to perfection. As a small child he was sent to Peking Opera School - a boarding school that trained drama students in a version of martial arts that combined acrobatics, tumbling and performance. This relentlessness is onscreen as well as backstage. Jackie Chan characters are never quitters. "He doesn't win because he's a better fighter, he wins because he never gives up." says Tony in his film. "It is a direct contrast to his American work where bad guys are defeated because someone shoots them." We writers could use that relentlessness. One of the most important things I've learned since I began writing is: There are no short cuts. Need to patch that hole in the plot? Need to give your character a personality transplant? Need to start again? You gotta do what you gotta do. A rushed ending, a thin character, an unsatisfying plot - once the book is published there's no turning back, no hiding from readers and critics. Jackie Chan earns his finish. Personally I think all the internet sharing exhorting writers to create an opening to hook a reader/agent/editor has resulted in a crop of books with fabulous openings ... but exceedingly weak and rushed endings. Think back on all the great books you ever read. What do you mostly remember? I'll bet it's not the opening but that delicious, surprising, exciting ending. Once you're published what matters is not how you grab your reader but how you leave him when he's finished reading your book. So ask yourself ... 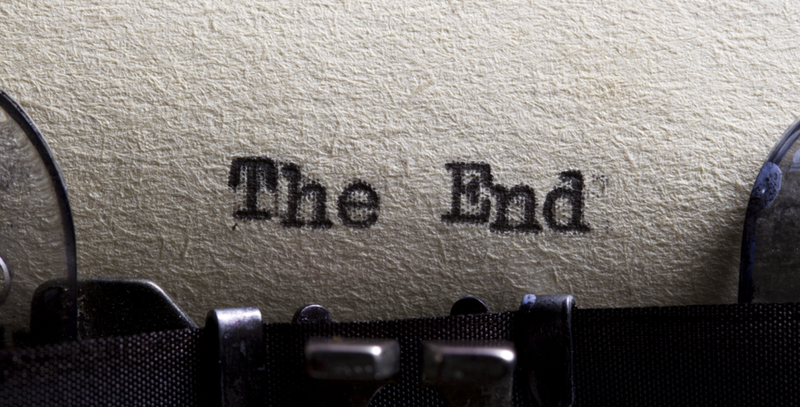 Does your ending leave your reader satisfied? Does your character deserve his ending? Has your character earned his finish? Have you? Candy Gourlay also blogs on her author website. Read her most recent post Killing My Darlings. A punchy and pertinent post. It highlights the huge efforts artists go to to make their work effortless. Brilliant, Candy. And I love Jackie Chan! Great post, Candy. And I wholeheartedly agree about the need to build to brilliant, satisfying finales. I suspect some recent books which arrived to great fanfare will quickly fade from our collective memories because they just don't deliver at The End. I don't know why authors wouldn't want to build to a big finish - they're so much fun to write! I was thinking of your short stories, Nick. Short story structure makes this point so clearly. The stand out thing for me is PRACTICE - nothign happens by accident, it all take practice. Fascinating post - thanks Candy. The point about clarity fascinated me. Jackie Chan opted for wide shots, often well lit scenes because he wanted the audience to SEE that it was not a trick. The fighting, the acrobatics ... they were real. He wanted to dazzle his audience with the truth. Writing a scene so that it feels like the truth, utterly real - though using different tactics of course - is the writer's challenge. Brilliant post, Candy! I was like a nodding dog, reading it. Thank you. I am visualising that nodding dog now! Thank you for reading (and nodding)! This is great, loads here that I am going to come back to, especially as I am plotting a new story atm. Really agree with you about the endings and how things needed to be planted long before they are needed. I love that you mentioned sometimes it's okay to 'tell', in fact it's a huge relief to hear it. I've always thought it should be a concious decision whether you show or tell, as an author you take into consideration what works best and what you are trying to achieve. 'Show don't tell' seems to be a bit of a mantra that people can follow slavishly without thinking about 'why'. I think it's become a mantra because it is the problem most beginning writers have to overcome. But its more complex and many shaded than simply showing not telling. When do you play out a scene? Why? You can be just as long winded when you're showing! The trick is to be sensitive to when you're boring your readers. "I used to sweat over plotting. I still do ... but thinking about action and reaction has made the task less excruciating." Great post. I feel the same way about plotting so this is an interesting way of thinking about it. Thank you! Thanks, Elinor. Its the toughest thing but also great fun. Thanks for posting this, Candy. I really enjoyed it, especially the ladder scene and the way you talk about planting clues and plotting - I was wondering what Jackie was going to do with the lion dance heads! Lots to return to here. I have to confess I watch the fight scenes and not the movies. The fight scenes have a narrative structure in themselves! Brilliant post, Candy. And I really know that you as a writer don't take short cuts. One thing I found interesting in the video is the notion of the rhythm of a fight. I suspect there is a rhythm to different sections of a book. In improv, you talk about "finding what the scene is about," which they dictates the positions the characters take up and their voices. Thanks, Joe! Interesting about rhythm - I feel it when I'm writing - that there's a beat needed here and there. But i couldn't possibly explain. So here I go- 'calm, again, one more time...' because the story is worth the effort. Have a great writing day, everyone. Even years after seeing them, Jackie Chan fight scenes are the ones I remember most clearly from all the many films (and fight scenes) I've seen. So it is with the best written books - and in retrospect, I realise that all those books utilise 'Jackie Chan's' concepts. Co-incidence? (Is Jo-incidence with a 'C'). Sorry. Friends flashback.